"Youll learn to create your own homespun essentials, such as mayonnaise, crackers, yoghurt, bread, muesli bars, hummus, cheese, and more. Complementing these delicious, nourishing treats, the book also includes recipes for other household items, like foodwraps, cleaners, air fres... read full description below. Eleanor Ozich is a bestselling author and photographer and mother to three young children. Since starting a blog six years ago, she has built a large following of loyal readers who look forward to her daily musings, recipes and ideas for living a less complicated way of life. Her unique approach to writing and photography showcases her love of all things simple in a natural, down-to-earth way. A self-taught cook, Eleanor grew up living above her parents' restaurant in Auckland. She has published two cookbooks, My Petite Kitchen and My Family Table, a lifestyle guide The Art of Simple, and contributes to various publications, including Taste magazine and The Natural Parent Magazine. She is also a contributor to Viva in the New Zealand Herald. 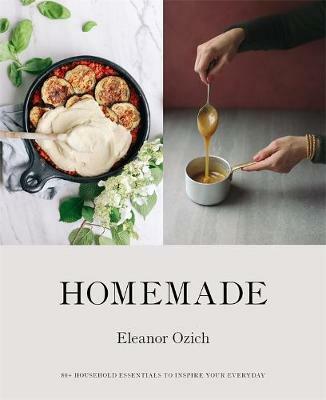 Eleanor and her family live in a small beach house surrounded by native bush in west Auckland.A self-taught cook, Eleanor grew up living above her parents' restaurant in Auckland. She has published two cookbooks, My Petite Kitchen and My Family Table, and contributes to various publications, including Taste magazine and The Natural Parent Magazine. She is also a weekly columnist for Viva in the New Zealand Herald. Eleanor and her family live in a small beach house surrounded by native bush in west Auckland.